Wanna poke or chat on FB?? Every time I log on to Facebook, with my first cup of tea of the day in my hand, I am in two minds about whether I should be online for chatting, or stay offline. 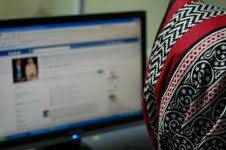 As Facebooking has become a ritual for me, I confess, that I cannot do without, that does not pose a dilemma. But “to chat or not to chat” is a cross road I am on every day. It’s like the moment you log in, people who have been hovering and circling pounce upon you within a fifteen second window. Sometimes I feel like chatting. At other times I don’t, but choose to log in because my best friend in Dallas and me had decided to chat at that particular time, or I am hoping to catch a colleague on chat to discuss details of the next write-up. But often before the targeted people get into a conversation with me, others have sent me hi hellos with hearts or smilies. And I end up feeling like the meanest person alive for not wanting to respond. So I end up responding, amidst yawns and feigned interest. What a predicament! The plus of it is that once in a while, it becomes an unexpectedly value-adding or fun conversation. An unanticipated chatter springs up on the list of “friend online” and it is great catching up or having an engaging conversation. And I have to write this also because otherwise all my chatty friends on FB are going to banish me for life, as humans have a way of assuming that THEY are being talked about, whether it is in terms of compliments or criticisms. Going offline immediately after someone excitedly wrote “Hey Farah! Long time no chat!” seems like the rudest thing you can do. But at times you don’t have a choice, do you? I mean if you were in the middle of an important chore for the day and logged in just for a wee bit, you are not in a circumstantial position to chat. Then there are those who, like me, are ALWAYS the round green bullet on the friends online list. They are there in a comforting, calming way. They fill the emptiness of the chat list with silence. I rather like such people. So what do you do in such a position when you don’t want to engage in a conversation? Iqra Moazzam, a teenager, has it all planned out. “I love the fact that FB has the chat option. It helps me stay in touch with friends. But sometimes it can be annoying. If I want to avoid someone, I usually go offline or give some really good excuse. Living in Karachi, you can always say ‘my electricity went’ or ‘my net died’ or ‘the FB chat doesn’t work properly’, and mostly these excuses are true.” Faisal Naveed, another teenager, says he would “simply pretend I am not there. Ignore”. Chat is still an understandable means of staying in touch. But what does a “Poke” mean? A lot of times, unforeseen people are poking you. Is this attention seeking behaviour? And then what do you do with a Poke? Let it remain there, hanging in limbo? Respond to it by poking back, even though you are not quite sure what it means? Or remove it? Or get irritated and annoyed? A Poke means what you want to think it means. Some people poke you because they think it’s funny. Some people poke you because they like you. There’s no one clear meaning to what a Poke is. Basically, it’s just a means to initiate conversation. It can mean a “hello” or a nudge. It’s just an indirect way of getting your attention, or a less public way of people letting you know they have looked at your profile, have been “stalking” you, or that they are thinking about you. Communication is at the basis of every psychosocial process. The age of the internet has made it easier. But like everything else in life, success is about just the right amount of communication. Hypercommunication (too much of it) or hypocommunication (too little of it), both are not healthy. Neither in relationships in general, nor on Facebook in particular. As long as the Pokes and chats are at a comfortable level of frequency, we can enjoy them. If they exceed a limit, well, what are the unfriend options for? Sakina Hussain, an artist, says that “Poke is a way to get attention without engaging in a conversation…. it’s virtual at its zenith.” Virtual is all about fun. It is time we stop taking it too seriously. Posted in Just Like That and tagged facebook. Bookmark the permalink.